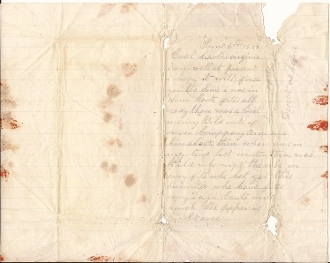 Soldier's Letter, 1 page, June 6th, 1864, Coal (Cold) Harbor, Virginia. Samuel P. Hartman (Co. E, 49th Pennsylvania Infantry) writes on a reused pre-war letter paper with wax seals from previous use still affixed, postmarked Washington D.C. 6/10/64 & handstamp 3, franked by the unit's Adjutant A. Hilands. Pencil, some paper loss from opening the letter. Addressed to Jefferson Hartman, Co I, 49th PA Infantry. "I am well at present. I hope it will find you the same. I was in some hard fights already. There was a good many killed out of our Company. Rine and Himeback them were was in my tent last winter them was killed. We whipped the rebs in every fight. We had yet this summer. We have fought every day. I cannot write much the paper is scarce. Samuel P. Hartman"
Spelling corrected for easier reading.